There is an urgent need for efficient utilization and management of resources to ensure sustainable development. Such efforts require a deeper understanding of the development process, the driving factors and the interlinkages within the system. The M.Sc. 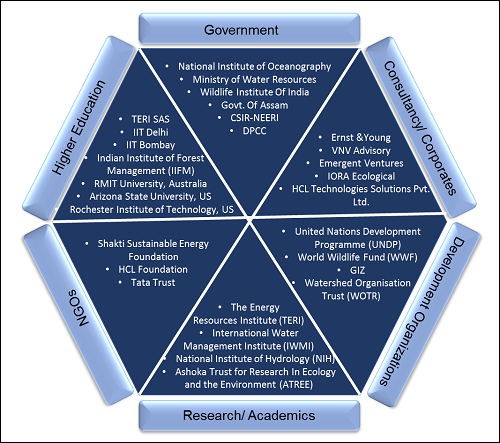 ESRM lays foundation for the students from diverse backgrounds to understand the interdisciplinarity of environmental and resources management and learn various tools and techniques. The programme is designed to build a cadre of professionals who are equipped with the knowledge and skillsets to deal with scientific and policy aspects related to environment and resource management. The theoretical concepts acquired through classroom session and seminars are complemented by the exposure to the real-world scenarios through various field visits during the two years programme. Students also get opportunities to be part of ongoing research projects in the university and enhance their knowledge. This unique degree programme fosters young professionals towards innovative and independent career goals. Students who complete MSc ESRM programme possess the requisite confidence and skills to work as efficient environmental researchers, project managers and policy planners in both public and private organizations. It will also be a structured route to doctoral research work. The University has a Placement Cell that helps students find suitable organizations to do their minor and major projects as well as final placement. Best Research Paper Award 2014 for published article in Journal of Environmental Development: 'Assessment of inherent vulnerability of rural communities to environmental hazards in Kimsar region of Uttarakhand, India'. Earthian 2014 Award from Wipro's Sustainability Programme to make sustainability integral to education. Ms Anusheema Chakraborty, student of MSc. Environmental Studies, 2012 batch received Best Oral Presentation Award in the 13th ESRI India User Conference held in December 2012 at Noida. A group of students from the M.Sc. in Environmental Studies and Resource Management (ESRM) programme at the TERI School of Advances Studies recently had an opportunity to understand the complexities of the lake water conservation and management programme at Udaipur and Mount Abu during a five day study tour. They interacted with local communities and experts and visited various lake restoration sites. The study in Udaipur was led by Dr Anil Mehta, a pioneer in lake restoration and water management. I learnt more things on field due to my course and I think that is the best thing TERI School of Advanced Studies gave me. Exposure and the motivation to work hard. TERI School of Advanced Studies has been a great place to develop me as an individual. It helped me develop professionally, it made me extremely sensitive to the environmental issues. This transformation of me from a normal individual to an sensitive professional environmentalist, shall be a win – win portfolio for the mankind. I would like to thank the entire TERI family, who helps nourish the young lot with a professional/expert guidance. TERI is a great place for ideas of transformation. TERI School of Advanced Studies is a world with various culture, full of different oppurtunities. 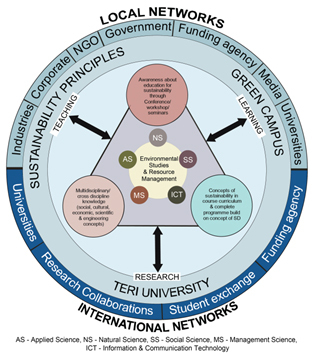 If you are looking forward to work in renewable or environment field, TERI is a ONE STOP solution. The ESRM programme is a mix of theory and practical components offered in an interdisciplinary approach with emphasis on research and application. It trains students in sustainability and empowers them to become responsible global citizens. The learner centric pedagogy comprises of classroom lectures enriched by case studies, field visits, term papers, assignment and tutorials, guest lectures by practitioners and experts, seminars and discussion forums.